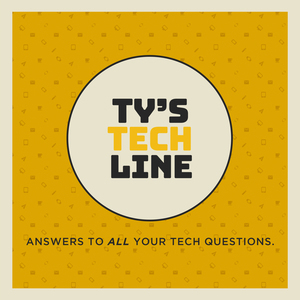 We found 10 episodes of Ty's Tech Line with the tag “ty”. Welcome to Episode 10 of a brand new segment we're trying out, Dear Monday! Join Ash & Ty every Monday as they share (very) short letters to each other, inanimate objects, and anything else they can think of! Welcome to Episode 9 of a brand new segment we're trying out, Dear Monday! Join Ash & Ty every Monday as they share (very) short letters to each other, inanimate objects, and anything else they can think of! Welcome to Episode 8 of a brand new segment we're trying out, Dear Monday! Join Ash & Ty every Monday as they share (very) short letters to each other, inanimate objects, and anything else they can think of! Welcome to Episode 7 of a brand new segment we're trying out, Dear Monday! Join Ash & Ty every Monday as they share (very) short letters to each other, inanimate objects, and anything else they can think of! Welcome to Episode 6 of a brand new segment we're trying out, Dear Monday! Join Ash & Ty every Monday as they share (very) short letters to each other, inanimate objects, and anything else they can think of! Welcome to Episode 5 of a brand new segment we're trying out, Dear Monday! Join Ash & Ty every Monday as they share (very) short letters to each other, inanimate objects, and anything else they can think of! Welcome to Episode 4 of a brand new segment we're trying out, Dear Monday! Join Ash & Ty every Monday as they share (very) short letters to each other, inanimate objects, and anything else they can think of! Welcome to Episode 3 of a brand new segment we're trying out, Dear Monday! Join Ash & Ty every Monday as they share (very) short letters to each other, inanimate objects, and anything else they can think of! Welcome to episode 2 of a brand new segment we're trying out, Dear Monday! Join Ash & Ty every Monday as they share (very) short letters to each other, inanimate objects, and anything else they can think of! Welcome to a brand new segment we're trying out, Dear Monday! Join Ash & Ty every Monday as they share (very) short letters to each other, inanimate objects, and anything else they can think of!